Hope you all enjoy this fun, Halloween mystery short story by Radine Trees Nehring. Pumpkin Jean’s Victims was first published in an anthology, Mysteries of the Ozarks, Volume III last winter. 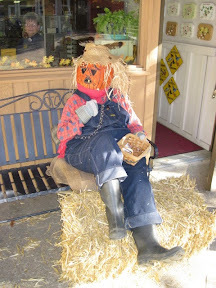 Pumpkin Jean is based on a real person who is a Halloween fixture at Ozark Folk Center State Park. Jean tried to remember how many years she’d been playing her Halloween treat and trick game at Ozark Folk Center State Park. Hmmm, let’s see. I began the year Larry Jonathan went away to university and changed his name to Larry–after those eastern folks joked about double names for men. That was four years gone. Then the three more years in law school, and another one wasting time. But Larry has had his practice in the city for six years now. Sure doesn’t seem like that long. Shoot, doesn’t seem that long since I first held him when he was born. Who was it said ‘Time flies when you’re having fun? She listened for his “I won’t, see you about 11:30. Have fun,” then picked up her costume and headed for the car. She loaded overalls, boots, and a sack of loose straw in the back seat, then brought out the huge papier maché pumpkin head with its open bottom, narrow eye slits and grinning mouth, and set it carefully in the front passenger seat. Last of all came her straw hat, bag of candy, a basket to put the candy in, and a sack of alfalfa cubes for Maggie. The square hay bales used to prop her legs and feet were already in place, so that was it, except for one last trip to the bathroom. There would be no break until Edward came by near noon. Forty-five minutes later Pumpkin Jean was settled, floppy scarecrow style, on her regular bench in the Folk Center Crafts Village. The pumpkin head sat lightly on her shoulders, her legs and boots rested on the hay bales. She’d come early enough to say good morning to Maggie, the gentle donkey who provided power for the park’s donkey carousel. Maggie, much-loved by Folk Center employees, spent winter months in Jean’s pasture and barn. During the long tourist season Maggie lived and worked in the park and Jean visited her frequently, bringing alfalfa treats whenever she came. But now the Crafts Village was ready to open, and Pumpkin Jean was ready to be ab-so-lute-ly still. She caught her first visitor only a few minutes later. A family with two children came to watch the top maker and while the children stared wide-eyed at the spinning foot-powered lathe, their father turned to look Jean over. When he came closer and reached out to take a piece of wrapped candy from her basket, her gloved hand shot out like a lightning bolt, grabbing his wrist. “Hey,” she growled, following with a laugh when he dropped his treasure and jerked back. “Gotcha,” Pumpkin Jean said. “Go on now, the candy is yours. Take some for the family, too.” She waved her flannel-covered arm toward the children and their mother, who had come to see what was going on. “You’re real! A person! I thought . . . well, yes, you sure got me.” He took four pieces of candy and handed three of them to his wife and giggling children before they all moved on. Pumpkin Jean leaned back and became motionless again, ready to surprise her next victim. She took a break at 11:30, and sat in Edward’s truck long enough to eat a sandwich and drink water. Then, when Edward announced the all clear, she returned to her seat on the bench and settled in to continue her Halloween treat and trick game. Things usually quieted down around noon while most visitors were enjoying food from the Smoke House snack bar or Skillet Restaurant. Indeed, no one was around when two men came out of the gift shop and stopped in front of her. The one wearing a tan windbreaker carried a large tote bag holding something heavy. They both looked around before the man in the blue pullover said, “Did you check the area?” Though the sentence was simple, his tone said Tan Jacket would be sorry if he hadn’t checked whatever area was meant. Both men looked around again, fidgeted, then paced a few steps to the left of Jean. She could no longer see them through the eye slits in her pumpkin head, and she heard only bits of their conversation through her pumpkin-covered ears. “. . . dark. Get in?” It was Blue Sweater’s voice. Mumbling. Then, ” . . . kick me?” A laugh from Blue Sweater, and more words Jean couldn’t hear. The sack rustled. Pumpkin Jean wished she dared move her head to see what was in the sack. This time Pumpkin Jean did not reach out to grab her victim, even though he took two candy bars. In fact, to be sure the illusion held, she stopped breathing. “Let’s go, people are coming,” Tan Jacket said, dropping a candy wrapper near the hay bales. Jean thought about the two men between visitors that afternoon. What had the peculiar conversation meant? Should she tell someone what she’d overheard? A couple of times she even forgot to grab her victims. Finally, as 4 p.m. neared, Pumpkin Jean slid off the bench. She waited a few moments for everything making up her personal meat and bones to unkink, then lifted off the pumpkin head. Moving clumsily in her heavy boots, she trudged toward the restroom to change clothes. She’d decided to quit early so she’d have time to tell someone in administration what she’d overheard. Thirty minutes later Jean left the administration building, wondering whether to be miffed or relieved. No one there had sounded patronizing, but they sure weren’t alarmed, either. “Jean, maybe they were workmen of some kind, we can ask around. And you know a park ranger is on duty at night. He checks the entire Crafts Village during his regular patrol. He’ll be sure nothing peculiar happens. I was not asleep, she said to herself as she walked to her car carrying the pumpkin head. Still, she decided not to tell Edward about what she might have heard. She did occasionally doze off during the long sessions as a pumpkin-head scarecrow. It could have been a dream . . . maybe. Pumpkin Jean was barely settled on her bench the next morning when a stir, then an outright ruckus came from the upper level of the Crafts Village. The sounds seemed to be centered beyond the music auditorium, probably somewhere near the carousel and donkey yard. Those men mentioned a donkey! Jean took off her pumpkin head, left it and the candy basket in the Folk Center Gift Shop storeroom, and clumped up the stairs toward the carousel. When she heard Maggie bray loudly, her worry faded, but she still hurried on. What she saw in the pasture brought her anxiety back full force. The park’s donkey handler had tied Maggie to the fence and was standing with her at the farthest distance possible from . . . from a man, lying on the ground near the pasture gate. There was blood on the man’s head. “Oh, please, no,” Jean said, not realizing she had spoken aloud as she opened the gate. “Is he . . . ?” She couldn’t say the word. Just then the man moaned and moved his legs, answering her unfinished question. A ranger took off his jacket and covered the injured man’s chest and arms. Feeling numb, as if she really were dreaming now, Jean went to Maggie and began stroking her neck. The donkey nuzzled her pocket, looking for a treat. Without thinking, Jean gave her a caramel, wrapper and all. “They say she did that,” the donkey handler whispered, using his elbow to point to the man on the ground. Maggie drooled caramel, bent her left front knee, and stamped a hoof next to Jean’s boot. “Sorry girl,” Jean told her, “I’ll bring you a real treat later.” She stared at the donkey man, a long-time friend. “They say WHAT?” She forgot to whisper, but everyone in the huddle ignored her. “That she attacked him. They say she kicked him over and over because he was bothering her–or, more likely, came in here with someone else to steal her. The ranger on patrol says he didn’t hear anything, but see?” He removed a hand from the rope that tied Maggie and pointed. “The gate to the auditorium parking lot isn’t hooked. They think maybe two men drove up with a horse trailer during the night and got the gate open somehow. Coulda even taken the inside hook off before the park closed.” He shook his head. After stroking Maggie’s neck for another minute, Jean walked toward the park rangers huddled around the injured man. Shaking his head, he moved aside. Hubbub. Questions and much discussion with Jean, and with Maggie’s handler. Injured man taken away in an ambulance. Park ranger left on guard over the empty pasture until detectives could search for possible clues there. Maggie, placid through all this, was tied next to the goats and sheep out in the Crafts Village, and Jean took time to give her three alfalfa cubes before going to answer more questions. “Hush a minute while I think,” she said to the young police officer who was more inclined to talk than listen. But at least he had made notes while she described the two men, so she guessed he was actually listening part of the time. Jean smiled at him. “Yes, I would, but hold up while I work through this. “Let’s see. They moved away for a bit, and I couldn’t hear all they said, but I could tell they were planning to do whatever it was after the area closed for the night. It sounded like they were going to unfasten the outside gate and then Blue Sweater would meet someone by the carousel when it was dark. She rubbed her forehead. What else had she heard? A nap. The man had mentioned a nap, because . . . . He turned and stared at her. Jean laughed aloud as the officer ran the few remaining steps and jumped in his car. As soon as he was out of sight, she headed for the gift shop. Pumpkin Jean needed to get ready for her next victim. Thanks to Ozark Folk Center State Park’s “Donkey Man,” Mule Skinner Sonny Graves; the real Pumpkin Lady, Julie Stow; and Folk Center Craft Director, Jeanette Larson. Loved the story, Radine, even if you named the protagonist after me. Thanks for sharing a wonderful Halloween short story. I loved it.